Pull-ups are one of those ubiquitous tests of strength, but a move that can humble even the toughest of men. Most who are unable to do this particular feat think the answer lies in more weights. And while your lats, biceps, and traps are doing work during this move, the real answer lies in your serratus anterior (SA), the muscle that holds your shoulder blade against your rib cage. If your SA isn’t working correctly, you are setting up the other 17 muscles that attach to your scapula to fail. When the scapula is out of position, you are putting yourself at a mechanical disadvantage. In other words, it’s not strength, it’s positioning. As a physical therapist, I am always amazed to see how much strength is trapped in the body because bones are out of position. When I put the bones back in to the right position, the muscles are at the right length, and all of a sudden, the body moves better. You may be strong, but you are always stronger in balance and in alignment. This is especially true for the strength and balance required to do a pull-up. Put the scapula in the right position, and your lower trap, biceps, and lats will work much better. With the scapula out of position, you are asking your teres major and minor (which are tiny muscles) and only a portion of your lat to lift your entire body. No wonder you can’t get your chin up to the bar. You need to start releasing muscles that attach to your shoulder. Modern life is about texting, working on the computer, and stuffing yourself into airplane seats built for 12 year old kids. The result is a forward head and rounded shoulders and ultimately, a shoulder blade that is constantly drifting forward and up. Gravity exacerbates the situation, pulling you down and further out of position. Here’s what you need to do. Get a lacrosse ball and then get to work. First release your pec muscles, then the teres (those little guys on the outside of your scapula that are working so hard to get you over that bar), and finally the upper trap. For the pec and teres, place the lacrosse ball on a tender spot and lean up against a wall. Lean a tolerable amount of weight onto the ball, then move your arm back and forth. For the trap, you want to find a bar bell, get underneath it so your upper trap is, well, trapped underneath it, shrug up and depress your shoulder. For each release, you will know it is working when your body starts to melt into the lacrosse ball or barbell. 1. 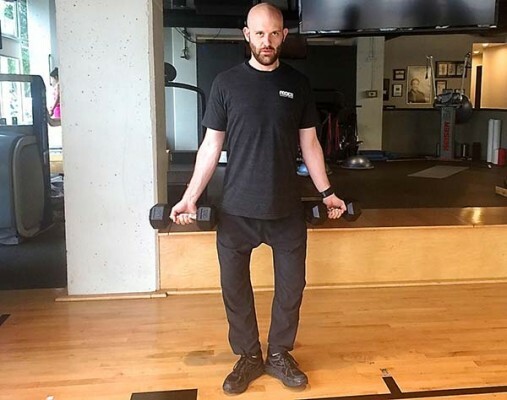 Lower Trap RDLs: Holding two dumbbells (or a barbell), stand with your weight on your heels and knees slightly bent and forced out. Your feet should be turned out at a 10–15 degree angle. Keep your palms forward, pinch your shoulder blades down and back, and squeeze your glutes. Slowly hinge at the hips, keeping your back flat and shoulder blades down and back. Slide the weights down, keeping them just in front of your shins, but not touching. Go down as far as you can without starting to slouch (ideally a 90-degree angle) then slowly hinge back up to the start position. The weights you use should be light enough that you can maintain good form but heavy enough to challenge you during the exercise. 2. 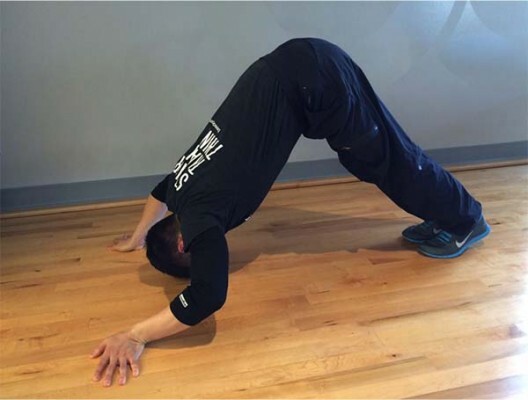 Downward Dog Push-Up: In a push-up position, lift hips toward the ceiling forming an upside down V shape. Be sure the back is straight and both legs are straight with the heels touching the floor. Both hands should be splayed and facing outward. With both arms straight, push into the ground so as to open up the armpits. In this position bend at the elbows, lowering your head to the ground, then push back to starting position. 3. 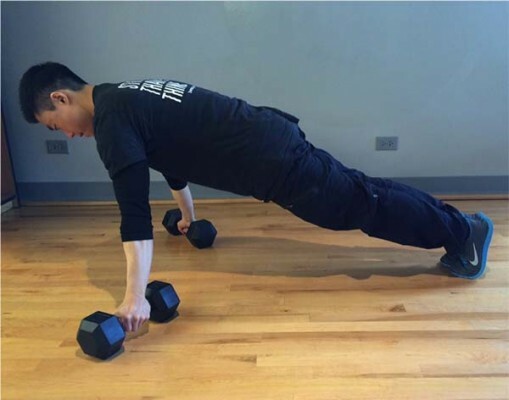 Scapular Stabilization Push-ups: Place dumbbells on floor, about three inches outside shoulders, turned outward at 45-degree angles. Start in a raised position, abs and glutes engaged, back flat, and head at a neutral position. Punch forward with shoulders to engage serratus anterior. Slowly lower toward floor, stopping when elbows reach a 90-degree angle. Raise to starting position. Repeat. 4. 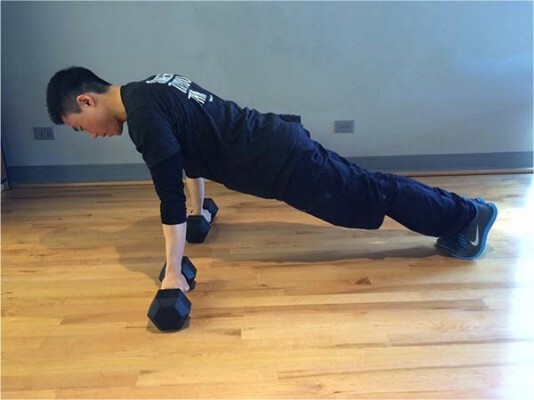 Serratus Anterior Stabilization Push-ups: Place dumbbells on floor, about three inches outside shoulders, perpendicular to the body. Start in a raised position, abs and glutes engaged, back flat, and head at a neutral position. Punch forward with shoulders to engage serratus anterior.